Home > Residential Geothermal > What is Geothermal? EcoMech is the Southeast leader for geothermal design and installation of geothermal renewable energy products for both new and retrofit. First, a geothermal system has three components and we will talk about those below. Secondly, we will also hit on a few myths about geothermal systems which some are truly funny! We hope after you read what a geothermal system is, how it works, how much it’ll cost, that you’ll be confident in making a decision to talk with us about your geothermal heating and cooling needs. Home owners believe geothermal contractors dig down to the Earth’s core for the heat? This is absolutely false! We will discuss this further below. Geothermal systems are not considered a renewable technology because they use electricity? FALSE. They use only one (1) unit of electricity to move up to five units of heating and cooling. Geothermal systems are high maintenance? False. They are actually less maintenance than a conventional heating and air system because the components of this system are underground and in house/encased and therefore protected from the harsh outdoor conditions. Geothermal HVAC heat pumps are noisy? False. No way! Most homeowners don’t even know when they are running because there is little to no sound from them. The earth has the ability to absorb and store heat energy. To use that stored geothermal energy, heat is extracted from the earth through a liquid, usually water that is then circulated in the ground via open or closed earth loops and is transferred to the heat pump heat exchanger. There, the heat is used to heat your home. In the summer, the process is reversed and indoor heat is extracted from your home and transferred to the earth through the liquid circulating in the loops underground. Closed Loop System: The term “closed loop” is used to describe a geothermal heat pump system that uses a continuous loop of special buried plastic pipe as a heat exchanger. The pipe is connected to the indoor heat pump to form a sealed, underground loop through which the liquid is circulated. Unlike an open-loop system that consumes water from a well, a closed-loop system recirculates its heat–transferring solution in a pressurized pipe. Open Loop System: Pond Loop: If it’s deep enough and large enough. A minimum of 8-10 feet in depth at its lowest level during the year is needed for a pond to be use-able. Generally, a minimum of 1/2-acre pond is required to provide adequate surface area for heat transfer. A geothermal or “ground-source” heat pump is an electrically-powered device that uses the natural heat storage ability of the earth and/or the earth’s groundwater to heat and cool your home or business at a high efficiency. Like any type of heat pump, it simply moves heat energy from one place to another. A geothermal heat pump is like a refrigerator because they work using the same scientific principle. By using refrigeration, the geothermal heat pump removes heat energy stored in the earth and/or the earth’s groundwater and transfers it to the home. Compression of any gas to a liquid state generates heat (remember your chemistry and physics classes). In this case the gas we use is called refrigerant. This high pressure refrigerant is then quickly discharged to a vapor state through the use of a nozzle called an expansion valve, the same way hair spray comes out of an aerosol can. That vaporized refrigerant is now really cold. This cold refrigerant is piped through a coil where air blows past it from your air conditioner unit and the cold is what you feel in the summer time coming out of your vents. Once this refrigerant leaves the coil it begins its journey again through the compressor that puts the refrigerant back into a compressed liquid state. Imagine putting the hair spray back into the can and pressurizing it again so that the cycle can start all over again. But wait. The compressor and the refrigerant are now really hot from all this work so the Heat Pump uses a fan to cool everything off. This is what you see sitting outside your house making all kinds of racket out side your bedroom window. In the winter time this process still happens but in reverse. Water is pumped through a series of closed loop pipes installed (either in a vertical or horizontal position) in the ground. Unlike air, soil doesn’t experience dramatic swings in temperature—it averages about 62 degrees year-round below 20 feet in the Atlanta metro area. So when the temperature outside is 14 degrees, it’s much more efficient for your compressor to extract heat from the 62 degree ground than from the 14 degree air and vice versa in the summer when the temperature is 98 degrees. Now I need to explain the draw backs to Air to Air heat pumps explained above. The heat pump is trying to discharge heat to the outdoors in the summer and it’s trying to absorb heat from the outdoors in the winter. This is pretty easy to do on a nice day such as 70 degrees. This is when your Air to Air heat pump is working at its peak SEER rating. Any body bought an 18 SEER unit lately? Ok so imagine you have to go do some yard work on this 70 degree day. Not too bad right? It’s because your body can absorb heat from the outside if needed pretty easily and discharge heat pretty easily if you start sweating if needed. Now imagine you have to do this yard work on a 98 degree day or a 14 degree night, pretty tough. This is when your unit is working at a very poor SEER rating probably in the single digit range. Remember SEER ratings are achieved in a laboratory. Looking back to the yard work scenario, imagine you finish up the yard work on that 98 degree day and your buddy starts fanning you off. This probably feels better than nothing, but imagine how much better you would feel if you jumped into a swimming pool. That would bring instant relief, right? The same concept happens in the winter if it is 14 degrees outside, jumping in to a 68 degree swimming pool might not feel so bad after all. Additionally during the summer your geothermal system gradually heats up the ground outside probably 25 degrees by the end of summer. When winter arrives you are going to begin extracting that heat that you have been storing up all summer long and again use it to help your heat pump warm your house. This process gradually cools the earth outside your home by the end of winter and the cycle repeats it’s self over and over, year after year. Just think of your back yard as a giant battery that stores energy in the form of heat. 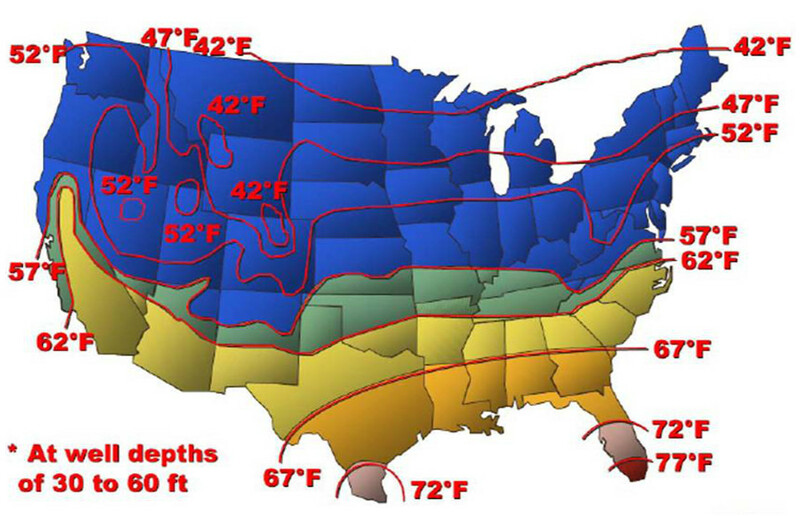 Simply understood, geothermal systems use the constant temperature of the earth for heating and cooling your home. How much maintenance is required in a geothermal system? Very little compared to conventional systems. If the distribution is air then filters would need to be changed. Heat pumps do not burn anything so most of the associated problems and maintenance required of boilers and furnaces is not an issue. Open loop systems that use ground water directly through the heat exchanger may need descaling every few years. Closed loop systems that circulate an antifreeze solution should be tested to ensure the quality of the antifreeze each season. Can geothermal systems be used for hot water supply? Yes it can! Using a desuperheater, you can turn the waste heat from the system into hot water. In the summer when the system is in cooling mode, the excess heat goes straight to heating hot water. In the winter when it is in heating mode, only a portion of the water is heated. 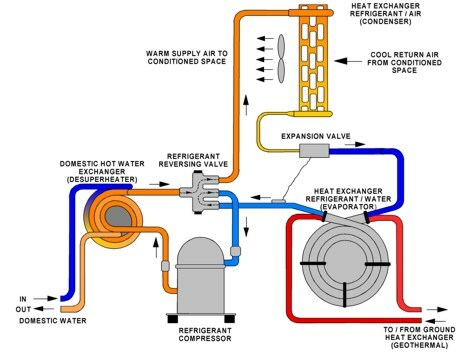 Desuperheaters are standard on some heat pumps, optional on others, and can also be bought as a stand-alone unit. If you’re looking for a new heating and air system, but you don’t want the maintenance troubles of a conventional system, then give EcoMech a call today. We can answer all of your questions about geothermal systems.